On Saturday night Stuart and I found ourselves at the BBC Radio Theatre in London's glitzy West End waiting for ever-wonderful Pam Ayres to perform. 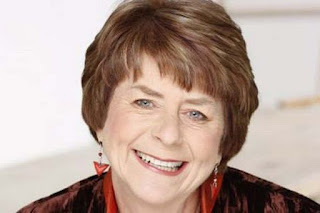 She was recording her latest series of Pam Ayres on the Air - an half hour BBC Radio Four show combining sketches, monologues and the inevitable and ever-welcome poetry. We witnessed a double recording of two shows entitled 'Holidays' and 'Grandparents'. I have to say she was superb. Full of great anecdotes - very funny. I'd not see Stu laugh so much in ages. Aside from the comedy at the front it was the audience that made us giggle too. All crusty old Radio Four demographics, mainly in couples who would be constantly producing hankies from sleeves and whisper to their partners about how cold it was... or how hot it was... or how long we had to queue... So very British. And you might find Elon Musk a little wearing.